How often should you wash your germy kitchen towels? New research suggests kitchen towels are a hotbed for germs that could potentially make you and your family sick. 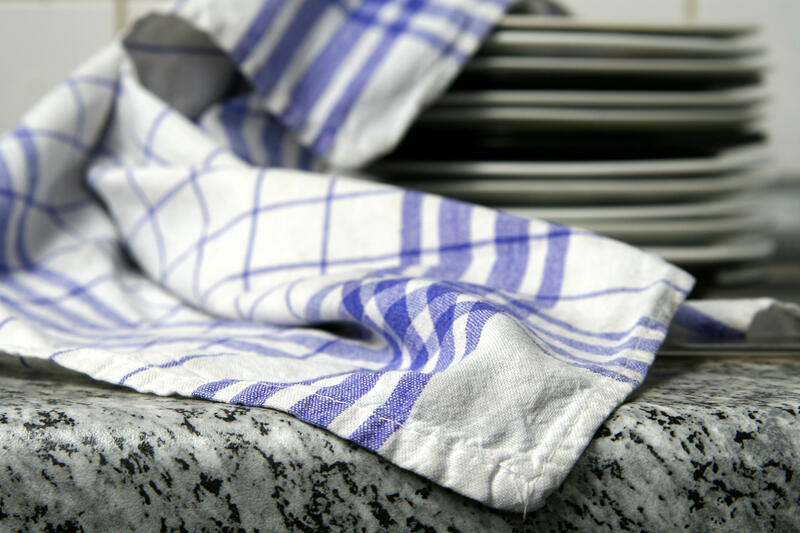 Researchers from the University of Mauritius tested 100 kitchen towels that had been used for a month and found that many carried pathogens that could lead to food poisoning. The study, presented at the annual meeting of the American Society for Microbiology in Atlanta, Georgia, found that 49 percent of the kitchen towels studied had bacterial growth. Of these samples, 36.7 percent grew coliform bacteria, a type that may include E. coli; 36.7 percent grew Enterococcus; and 14.3 percent grew staphylococcus aureus, a type of staph that can cause serious infections. The researchers also found there was significantly more bacteria on the dish towels of larger families, extended families and those with children. The type of foods people ate also played a role. The risk of harboring coliforms, such as E. coli, was higher in humid towels than dry ones. Those germs were also more likely to be found in multipurpose towels -- those used for wiping utensils, drying hands, holding hot implements, and cleaning surfaces -- and on the kitchen towels of families who ate non-vegetarian diets. But while these numbers may seem alarming, Anthony D. Baughn, PhD, associate professor in the Department of Microbiology & Immunology at University of Minnesota Medical School, said there's no reason to be overly worried. "Kitchen towels won't necessarily make you sick," he told CBS News, "but they are a reservoir for these organisms that can sometimes be problematic. E. coli, for example, is in the news a lot for foodborne illness, but not all E. coli are the same. Many E. coli, even if you ingest them, you wouldn't get sick." Still, some strains of E.coli can cause food poisoning and experts say there are steps you can take to protect yourself and your family in the kitchen. For one thing, the researchers suggest you avoid using kitchen towels for multiple purposes. The USDA also recommends washing kitchen cloths regularly. But just how often do you need to swap them out? Experts say ideally, every day. "They should be machine washed in hot water with soap and bleach if white, or if colored use a peroxide-containing soap made for sanitizing colored clothes," Philip Tierno Jr., PhD, clinical professor of Microbiology and Pathology at NYU School of Medicine, told CBS News in an email. "Many washing machines and dryers have a germicidal cycle, which is useful if possessed." He adds, "while they should be changed daily, when knowingly contaminated by food or meat drippings, etc, change them out for a new towel immediately." Baughn also notes it's important to remember that if you cut yourself while cooking, don't grab that kitchen towel you used to dry food or clean potentially contaminated surfaces. "Don't wrap your finger in that towel that might be laden with staph," he said. "It's better to get a fresh towel. You don't want to to introduce the bacteria into that cut." Neither Baughn nor Tierno were involved with the study. Wash hands with soap and warm water for 20 seconds before and after handling food, and after using the bathroom, changing diapers, or handling pets. Use hot, soapy water and paper towels or clean cloths to wipe up kitchen surfaces or spills.